Workshops at your home, scheduled as per your convenience! For queries please contact BlueBulb by clicking here. This workshop is for one family/household. And can be attended by not more than 5 people. Occupy your window! And turn every sq. foot of sun-light into a bustling organic farm growing all the herbs and vegetables you can stir fry. And since every house, and its windows, is different, we will come over and show you how and what to grow based on your conditions. This workshop is designed to get everyone at home involved, which is why we do not charge per person. Our expert urban gardener will help you understand sunlight, crop planning, what to grow and in what. You will get to play around with different types of seeds, and learn how to sow and water them. This is a hands on workshop, you will be wristwatch deep in organic compost and coco peat, which is actually coconut husk and so much fun. Within a few weeks you can say goodbye to chemically stuffed, mutant vegetables and get your vitamins from the farm at home. 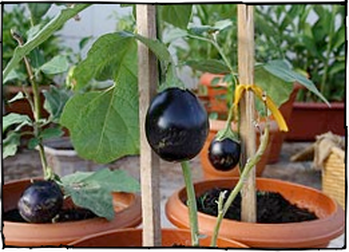 You will learn to grow brinjals, capsicum, chilies, spinach, coriander, mint, basil and lots more. Right out of your window! We use light-weight planter bags which are very building-friendly. These big colourful veggies will look so yummy on your window, you’ll want to just drizzle them in olive oil and toss the whole pot into a pan. But that’s not a good idea . Which is why we’ll even show you how to pluck your greens. Since nothing goes to waste in an organic farm, you will learn how to turn everything in to compost and use it to feed your plants. And use natural remedies to keep your plants pest-free. Along with all training you will get, 2 plants in planter bags with a coco peat-compost mix and 8 different types of seeds in seed cups. This way you can start harvesting your first crop within a week or two, while your seeds are growing.